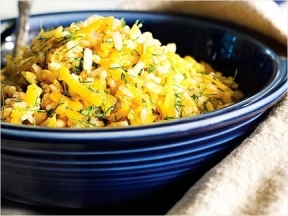 Grated butternut squash adds color and nutrients to this brown rice pilaf. Greeks like to use winter squash, especially pumpkin, to make savory and sweet pies, fritters and croquettes, casseroles and myriad other dishes with fall’s telltale vegetables, but these dishes are virtually unknown outside the country. It’s traditionally made with pumpkin, but since most pumpkins in the U.S. are grown for carving jack-o’-lanterns (and not for cooking), we’ve modified the recipe to work with readily available butternut squash. The original dish calls for Greek pilaf rice, a short-grained, polished rice that is hard to find outside the country, so we’ve substituted instant brown rice. Grate the squash through the large holes of a box grater. Heat oil in a large cast-iron or nonstick skillet over medium-low heat. Add onion and garlic and cook, stirring, until soft and lightly colored, 10 to 12 minutes. Combine 2 tablespoons water and tomato paste in a small bowl and stir it into the pan. Add rice and stir to coat. Add the squash, in batches if necessary, and stir until it has reduced in volume enough so that you can cover the pan. Increase the heat to medium-high, pour in 1 3/4 cups water (or broth) and wine, cover and bring to a boil. Reduce the heat to medium-low and cook, covered, stirring once or twice, until the rice has absorbed most of the liquid and the squash is tender, 25 to 30 minutes. Add fennel fronds, oregano, salt, cinnamon and pepper; gently stir to combine. Remove from the heat and let stand, covered, for 5 minutes. Serve hot or at room temperature.